Don Rodrigues, Regional Vice President Southeast for Guitar Center stores, pictured with D.A.S. 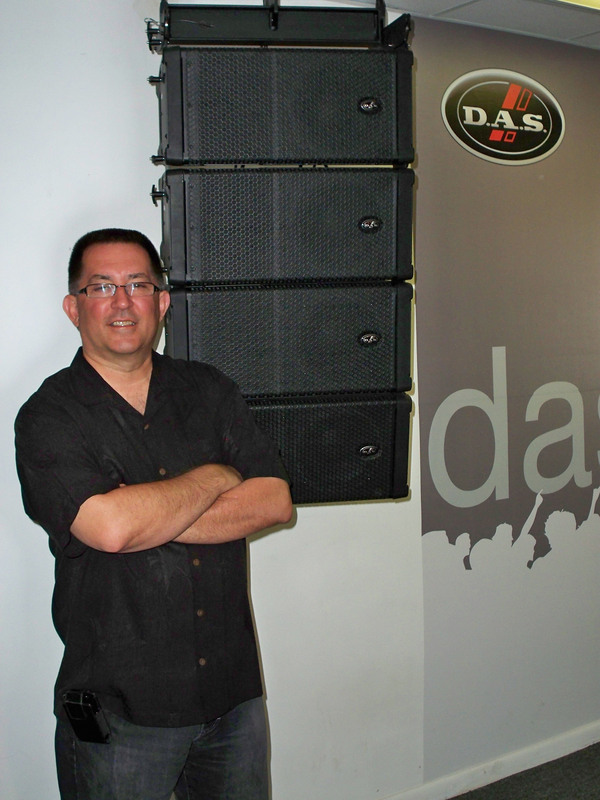 Audio’s Aero line array at D.A.S. USA headquarters in Miami, Florida. WESTLAKE VILLAGE, CA, April 18, 2011 — Guitar Center Professional (GC Pro), the outside sales division of Guitar Center that focuses on the needs of professional users, is pleased to announce that it has substantially enhanced its relationship with D.A.S. Audio, a leading global manufacturer of live sound, installed sound and portable sound systems and components for the past 40 years. Previously, D.A.S. Audio supplied products for very specific sales through GC Pro’s location in Hallandale, Florida. Now, the entire line of D.A.S. Audio flagship products, including the Aero Series 2 and Avant live sound systems, Road Series monitors, and Variant, RF, and Arco Series installed sound products, as well as all components and amplifiers in the D.A.S. Audio product line, are available through GC Pro locations nationally. D.A.S. Audio demo products will be located in four GC Pro centers: Hallandale, Florida; Hollywood, California; New Orleans and Atlanta. Systems at these locations are fully tuned and time-aligned and offer the rare advantage of allowing customers to test-drive an array product in-store. And all D.A.S. Audio products are available through any GC Pro store and representative. Photo Caption: Don Rodrigues, Regional Vice President Southeast for Guitar Center stores, pictured with D.A.S. Audio’s Aero line array at D.A.S. USA headquarters in Miami, Florida. Recognized around the world for its quality products and customer-oriented service, D.A.S. Audio offers exceptional customer support both before and after the sale, on-site technical training seminars and long-lasting business relationships. D.A.S. Audio is committed to innovation and the development of high-quality products. The R&D department employs highly qualified professionals and state-of-the-art technology allowing the company to undertake ambitious projects and compete with the best. D.A.S. has secured its position as a market leader in the sound reinforcement industry while continuing to establish itself worldwide and develop new products that satisfy the requirements of an ever-changing market.